NewsLeecher Newsreader Review 2017. It is known to be a powerful newsreader thanks to its many interesting features that are only supported by expensive newsreaders. It is the first newsreader to have a super search feature. This allows users to browse articles through Usenet without the need to download any headers. At the time, it was quite annoying to find the articles you want on Usenet. As a result of competition, they have improved their game and introduced other cool features. For instance, they are well-known for their advanced feature known as “SuperLeech,” that helps users to access NZB automatically without the need of initiating the process automatically. The installation process is quite simple. You just need to choose a folder where to install and choose quick launch and desktop icons. In the past, the price for this software was $19.99 per year or $29.99 for those who wanted the “Super Search” feature. Since 2015, Newsleecher Newsreader introduced subscription-based model. Now for just $3.99 per month, you had access to the software and search services. With $9.49 per month; you get unlimited Usenet access. You will find the provided deals pretty cool. This is because the prices are within what other regular plans of the majority of Usenet providers. Also, you may get discounts occasionally. All plans come with a free trial service for 14 days with unlimited Super Search. You will be limited to 14 GB of Usenet transfer. You can cancel from the members’ dashboard. If you are not happy with the service, ensure you cancel within 14 days after signup. If you fail to cancel within the stipulated time, your chosen plan will be automatically billed. You will then continue using your account without any limits. Newsleecher Newsreader offers two main payment options: credit card and Paypal. Your account will not be charged unless subscription is active after 14 days from signup date. Also, for card payment method, there are no extra fees charged to your transactions. All the expenses are part of the package prices listed above. Newsleecher Newsreader has premium features provided by the modern newsreaders such as support for backup servers, NZB support, and automatic processing of articles. One of the top features is the in-built spam filter, which scans articles to determine whether they are fake. This makes Newsleecher much better than its competitors in dealing with spam. The good thing about Newsleecher Newsreader is that you can get articles on autopilot as soon as they are posted in newsgroups. You can easily search all groups quickly and find new articles. Unlike its competitors, Newsleecher does not come packed with any spyware, malware, or spyware. With Newsleecher Newsreader, you can easily export and import from the NZB format. You can get articles posted in various newsgroups. There is no limit to how many articles you can access or limits on speeds. As far as usability is concerned, you will find Newsleecher Newsreader to be very easy to use. The setup process is quite straightforward, and you will not experience issues using its advanced features. It is important to note that Newsleecher Newsreader supports NZBs. This makes it great if you want to use it with an NZB site of your choice. Moreover, it takes care of RARs and PAR2s automatically. Therefore, there are no complications when it comes to NZB support. As of now, Newsleecher Newsreader is available for Window operating systems only. Hopefully, in the future, the software will be available for Apple operating systems. Usually, newsreaders tend to be slow when using fast, modern connections. In most cases, they utilize less than maximum possible speed. According to developers, your speed of accessing articles is not limited. The current version 7.0 is quite stable. Therefore, you are likely to experience a few crashes. Also, the developers keep updating their software and thus, making Newsleecher Newsreader more stable. If you have issues with the software, you can contact their 24/7 customer support. You will need to fill a contact form on their website. Their technical support team will then contact you after a few minutes. They also have a forum where you can ask your questions and meet other users. In fact, they have a Forum section dedicated to technical support. You can post your questions there. You are protected with the 256-bit SSL encryption. No matter the plan you choose, your privacy is protected against traffic shaping from both your Internet Service Provider and Usenet provider. Also, it has servers located in the US and Europe. This minimizes the distance between your computer and your Usenet server where articles are stored. 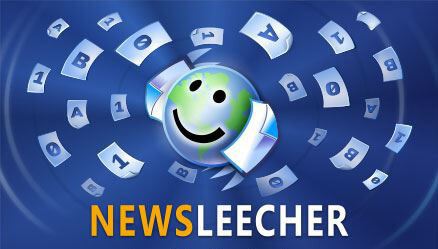 Newsleecher Newsreader works with many Usenet Providers. During setup, you will need to configure to your favorite Usenet provider. For instance, you can configure it with UsenetServer, Newshosting, and many others. You will find Newsleecher Newsreader to be top software with minimal issues for a good price. It is innovatively designed to do what modern newsreaders can do such as powerful spam filter, backup servers, automatic downloader, and search engine. With the new version, there are minimal infrequent lags and crashes along the way. The fact that every plan comes with a free trial for 14 days gives you a reason to try. In fact, the free trial gives you an opportunity to determine whether Newsleecher Newsreader is for you or not.